Whether in government, enterprise, or the nonprofit sector, there exists a colossal amount of data in need of protection. With the exponential growth of data comes the exponential growth of professional positions needed to protect that data, yet the fact continues to be true that our nation has a significant workforce gap of cybersecurity professionals. To face this nationwide dilemma head-on, U.S. Cyber Challenge created a comprehensive methodology to identify potential talent, assess their skill levels, teach proper ethics, and network these individuals with public and private sector organizations that are hiring. In April, U.S. Cyber Challenge will open their annual Cyber Quests competition where thousands of individuals across the nation will attempt to earn an invitation to one of the three summer cyber camps by achieving a top score. Southern Utah University will host the Western Regional camp, while Illinois and Delaware will host camps for top competitors who live east of the Mississippi River. Each camp has a series of intensive classwork with top-rated instructors, an ethics program, resume workshop, a career fair, and a culminating competition to give the participants more hands-on experience. In most professional fields, traditional methods of learning and achievement–including higher education degrees and certifications–are highly valued, if not required, to land a job. Yet today in cybersecurity, some of the most talented individuals are not necessarily acquiring their knowledge and skills through traditional means. Instead, they are teaching themselves by watching YouTube videos, reading blogs, and simple trial and error. Competitions, like U.S. Cyber Challenge, are validating the skills acquired through these untraditional methods. In addition to the camps and competitions, U.S. Cyber Challenge initiated the development of a new online social network specifically created for “cybersecurity enthusiasts,” those involved in cybersecurity either from a hobbyist level all the way up to the C-suite, called CyberCompEx (www.CyberCompEx.org). On the portal, members have the opportunity to learn more about cybersecurity and network with others in the field 24/7 through the use of forums, articles, podcasts, events, and competitions. CyberCompEx recently launched new tools specifically focused on career development. The platform added resume creation and job searching capabilities that help round out the site’s mission to help talent from start to finish as they navigate their career paths and fill the workforce gap. The mission of U.S. Cyber Challenge is to significantly reduce the shortage in today’s cyber workforce by serving as the premier program to identify, attract, recruit and place the next generation of cybersecurity professionals. On March 15 in Washington D.C., U.S. Cyber Challenge will be hosting its 3rd Annual Cybersecurity Summit in partnership with AFFIRM. The summit will bring together chief information officers, chief information security officers and other influential leaders in government, industry, and academia to discuss the growing threat in cybersecurity and methods to attract and retain talent. Speakers include Dr. Diana Burley of The George Washington University, Donald Davidson Jr. of the U.S. Department of Defense, Dr. Douglas Maughan of the U.S. Department of Homeland Security, Randy Marchany of Virginia Tech, Richard McKinney of the U.S. Department of Transportation, Rodney J. Petersen of the U.S. Department of Commerce, John D. Ramsey of the U.S. House of Representatives, Angela Rey of DISA, Ben Scribner of the U.S. Department of Homeland Security, Steven J. Spano of the Center for Internet Security, Bobbie Stempfley of The MITRE Corporation, Ira Hobbs of Hobbs and Hobbs, LLC, Mike Causey of Federal News Radio, and Aliya Sternstein of Next Gov. To learn more about U.S. Cyber Challenge, visit the website at www.USCyberChallenge.org. To register and begin participating on CyberCompEx, go to www.CyberCompEx.org. Karen Evans is the National Director for the U.S. Cyber Challenge (USCC), a nationwide talent search and skills development program focused specifically on the cyber workforce. 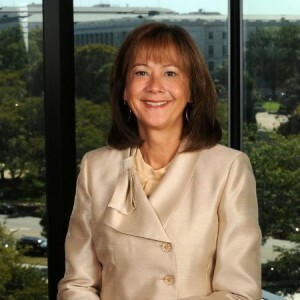 She is also the former Administrator for E-Government and Information Technology at the Office of Management and Budget (OMB) within the Executive Office of the President, where she oversaw the Federal IT budget of nearly $71 billion, which included implementation of IT throughout the Federal government.